Canoeing at Dawn on Port Isobel. NWF photo by Laura Hickey. It’s true: I am a very fortunate person and I have the coolest job. And, I was lucky enough to be asked to attend a Chesapeake Bay Foundation (CBF) three day workshop off of Tangier Island, Virginia with 22 Fairfax County Public School principals to have a “Meaningful Watershed Educational Experience,” or MWEE for short. Did I have a MWEE? You bet I did. In fact, it was so meaningful that I’ll be working with my team to enhance the NWF Eco-Schools USA Water Pathway to include more information about watersheds, precious and imperiled wetlands, and the people and wildlife that depend on them. We’ll link to CBF’s great tools and resources as well. But, there were also actual hands-on experiences on the Bay, such as a sunrise canoe trip to go “progging” (Tangier-speak for looking for sea treasures on the beach), setting and harvesting crab pots, and crab scraping. 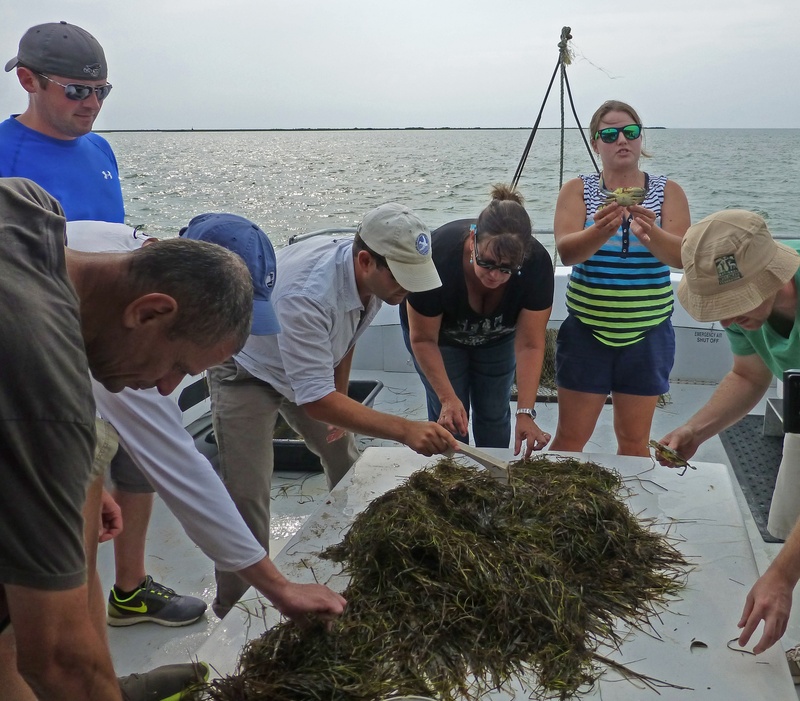 Crab scaping is not what you might think, but rather a way to dig up sea grasses (widgeon and eel sea grass) to see what small sea creatures live there (blue crabs, pike fish—a cousin to the sea horse—small shrimp, and so many others). Crab scraping. NWF photo by Laura Hickey. We learned about the Menhaden, part of the Herring family, which are a mainstay of the fisheries in the Bay. Not good for eating, but excellent as a fertilizer, and used in many common grocery items such as cookies, cat food, and cosmetics. We used Menhaden as the bait in the crab pots. The crab harvest is low this year, most likely due to the cold winter, and the watermen are concerned but have faith it will recover. We saw water birds, too – amazing Osprey pairs, Herons, Egrets, American Oystercatchers, Least Terns, Greater Yellowlegs, and even the tracks of a Muskrat. Principal Adam Erbrecht, Daniels Run ES. NWF photo by Laura Hickey. And, I was able to talk with and listen to the principals at 22 different elementary and middle schools in Fairfax County to hear how they’d like to green their school, and how they want to learn how best to help their teachers and students to become more environmentally literate. We worked together on plans for the coming year, laying out goals for increased environmental stewardship and action. We were blessed to have Stephen Ritz from the Green Bronx Machine with us on this trip. Stephen is a teacher in New York’s tough South Bronx, where he and his kids grow lush gardens for food, greenery — and jobs and he is a true environmental hero, and newfound friend to NWF. I’m looking forward to doing so much more with Stephen in the future as we look at ways we can work together. Check out Stephen’s TED talk to learn more about the amazing way that he is transforming at-risk student lives in the Bronx. A sign I saw at Spanky’s Ice Cream Shop stayed with me and epitomizes the good people of Tangier Island but also what we’re all trying to do to green our schools, students, teachers, and communities. – H. Johnson Brown, Jr.
Then, sadly, it was time to go home. But I left the Bay with a newfound appreciation for this incredible watershed, the people who live and depend on it, the people at CBF that work to protect it, and the principals and schools that I’m lucky enough to work with in Fairfax County. I’m looking forward to doing this again and again.